My Camino - If I can walk 500 miles…. In April 2018 I lost my job! The company underwent a major reorganization I had a job that I enjoyed, so it was emotionally difficult when it ended. I was not ready to move on; I still had more to do. I experienced anger and frustration. Somewhere in the search for what to do next, the idea of walking … by myself … to Santiago de Compostela was born. “El Camino de Santiago” is an ancient pilgrims route that leads from many points of the world to the Cathedral of Santiago de Compostela, located in Northwest Spain. It was an important pilgrims route for Christians. Pilgrims have been walking these trails since the Middle Ages, on their way to the Cathedral, where the remains of St James are reputedly buried. Nowadays each pilgrim has their own reason to walk to Santiago. Starting in France at Saint-Jean-Pied-de-Port. I began my intense physical challenge; intense even for a sporty spice like me. 500 miles. 5 weeks. 15 miles per day. I endured blisters, muscle cramps and even had 2 days that I could barely walk. It was not just the physical. It was hard mentally. I had lot of internal dialogues. Some days I was confronted with negative thoughts, demons from the past and internal pessimistic voices. That I actually wanted to throw away my walking sticks and just wanted to lay down on the beach instead. But the Camino also brought me liberation. I discovered that silence is not frightening but loving. And walking taught me a lot about myself, confronting but also healing. Today we are obsessed with speed. Being faster, being more efficiently. The Camino forces you to slow down, slow your pace down and enjoy taking your time. When you walk slower your focus shifts, your mind starts paying attention to lots of tangible senses going on in your body and gives you space to focus your attention inward. It allows you to take in the beauty of your surroundings, to notice the way the landscape slowly changes as you make your way through it. When you walk slowly you actually see more, you hear more, smell more and touch more. You perceive more. For me the Camino was an opportunity to step back, slow down, disconnect, and take a moment or two for myself. 5 weeks taught me how to bring some of that calm home with me. . Yes, I returned to the demands of daily life, but I returned to them with less urgency, and somehow, manage to get things done anyway. After a few days walking, I realized that planning was futile. I absolutely would get to my end point but my days were not always going as planned. Due to physical or mentally challenges, weather conditions, material defects, you name it. So I decided to let the plan go, to sleep or stop when I was tired or in pain and eat when I was hungry. 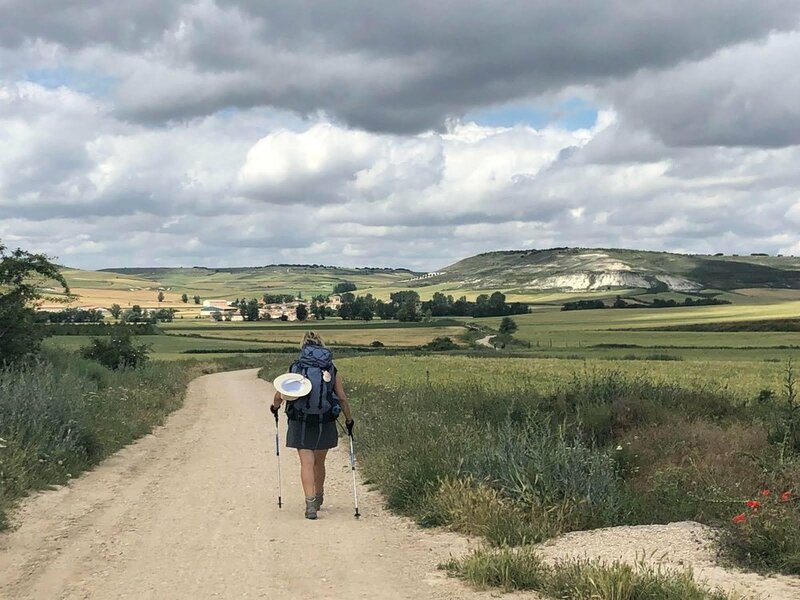 I learned to take the day as it comes and deal with the problems and opportunities that are crossing my path during that day, not only while I was walking the Camino but also now in real life. Planning is nice but isn't going to guarantee you a desired outcome for the future, so why not accept what you can control now..
One of my favourite things of the Camino is the people that you meet, the friendships you build and how easy it is to get real with people quickly. In our daily lives, we dance around each other and there is a lot of “keeping face or keeping up appearances” going on as we get to know people. On the Camino we are reduced to our most basic appearance maybe because we are removed from others’ expectations of who we are or our expectations towards others. And this allows other aspects of our personality to come out. It is really about you, as a person and occupation or status is irrelevant. I am grateful for all friends that have turned into my Camino family, who shared their stories (from happy to sad from tears to laughter and back) with me and listened to mine. On the Camino there are several symbolic places at which there is a tradition of forgiveness, Cruz de Ferro is such a place. Tradition asks you to carry a stone from your home to lay at the foot of the iron cross. Most would say that the stone symbolizes either; asking for a blessing, releasing burdens carried in this life, something that you are ready to let go of, or asking for forgiveness of sins. To me it was a significant and a very personal moment, as it also will be for others pilgrims. But leaving the stone behind, which was already in my backpack since Amsterdam was an opportunity to look into myself and find forgiveness for my own shortcomings , it was about tolerance and forgiveness of others. It taught me to take responsibility and to lighten up on myself and others so I could move on. Some people talked about ‘finding’ themselves on the Camino, asking me what I was searching for? But maybe it is more about ‘becoming’ yourself. It is so easy to lose yourself while growing up and many people do. We are all influenced by different factors in life, some of which are positive and some are negative. Walking gave me time to reflect, to think about and maybe even rediscover what I’m actually like, what I want and fearlessly acknowledging it. I realized that I’m pretty much everything I need. I’m the source of all my happiness, sadness, failure and success. I can have all these feelings and still be ok. Therefore the burden of others’ opinions and ‘shoulds’ gets lighter. I trust myself to make decisions! Every time you take a step into the unknown, you experience fear. I was afraid of the physical pain that I would feel, the mental challenges that I would face, fear of waking in silence all by myself, fear of giving up and I could go on and on. I had a lot of excuses not to do this Camino, but fear is a bad advisor. Overcoming this fear taught me that I’m capable of so much more than I realise. I have come back with a clearer sense of purpose and I now have more confidence to keep walking in that direction, I know that I can cover a lot of distance by taking consistent steps in the same direction. It gave me the courage I needed, made me a fit and happy self-confident person, ready to take on the world which is calling out to be explored. So I’m following the call.